For over a century scholars have debated about pyramids, when they were built, by whom, what for. Here first we consider their dating, a difficult and still open problem; then we relate the Giza system to three sacred mountains in the heart of Asia, two of which are associated with the river Indus, the third one with the mount Kailash, or Meru, the most sacred in Asia if not in the world. We briefly consider also a possible relation with the Mother Goddess. Finally we discuss who could have been the builders of the pyramids, assuming that they came from Asia. The pyramids Giza system is a complex structure located on a little elevated plateau not far from ancient Memphis and Heliopolis. It is now on the outskirts of Cairo, the multimillion city that will soon surround the pyramids. It consists of the Sphinx, a giant statue of a lying lioness with a pharaoh head, but see Temple (2000) for an alternative view, and of three great pyramids. Two of them, the so called Cheops and Chefren pyramids, are among the highest buildings of ancient world, having a similar height (Cheops’s originally 280 royal cubits, now about 140 m due to erosion; Chefren now about 136 m, one royal cubit being about 52 cm ); if one takes into account that Cheops pyramid was built on a little higher rock basis, then the two pyramids appear to be of essentially the same height. The basis of the Cheops pyramid has a side of 1460 stones, 1460 being the number of years in a Sothic cycl; the length of the basis is in meters of about 230, in royal cubits, 440. The third pyramid, the Mikerinos pyramid, is located a little more far away and is much smaller. The above pyramid names are those of three pharaohs of the fourth dynasty of the Ancient Kingdom. Dating accurately pharaohs is difficult, due to problems with their chronology, given e.g. by Manetho (whose lost history is partly quoted by other authors), by the Turin papyrus, the Palermo stone and so on. For example the date given for the Cheops pyramid termination is about 2560 BC in Wikipedia; the one by David Rohl (1995) is the 20th century BC. For later dynasties the problem is even more complicated, see Velikovsky (1952, 1960, 1977, 1978), who claims that the length of Egypt history has been increased by ignoring co-regencies or parallel dynasties, and by an error by Champollion and Lepsius in dating the Sothic year quoted by Censorinus. An error that was also claimed by the astronomers Clube and Napier (1982). Our opinion is that pharaoh Menes, the beginner of the first dynasty (his name we find elsewhere as Manas, Minos, Manu, Mannu…), should be set about 300 years after the Biblical Flood, that on arguments to be given elsewhere we date at 3161 BC plus or minus two years. The 300 years pertain to the period of chaos and general misery that followed the Noachian Flood. Some traditions, see Plutarch’s Isis and Osiris, state that Osiris was born just after the Flood (when the number of days in a year changed from 360 to 365), and took care of Egypt to re-establish more civilized conditions. Thus we might set Cheops at around 2700 BC. A time that saw also the development of the Sumerian city states, the Indus-Sarasvati civilization, the civilizations now emerging in the steppes and deserts of Asia north of Iran and Afghanistan, in the so called BAM archaeological region…. It is usually stated, see e.g. Herodotus, that Cheops build the pyramid as his tomb, in about 20 years using some 100.000 workers. Fiorini (2012), an architect specialist in large constructions, shows how the pyramid could be built in 25 years, using only 4000 workers. Strabo quotes 360.000 workers, but it is possible that this is one of the many numbers modified by multiplication by 180, see Spedicato (2011), so that the real number would have been only 2000, thus even less than the estimate of Fiorini. There is no evidence that Cheops pyramid, and the other two of the Giza complex, were used as a tomb, many arguments having been given against this assumption. It is however natural that Cheops, in addition of freeing the Sphinx from the sands that covered it completely, as stated in an inscribed stone found near the Sphinx, repaired the Great Pyramid that was certainly damaged during the cataclysmic events of the Flood. Similarly it is quite likely that the pyramids were repaired after the damages due to the Phaethon explosion and the associated great earthquake and tsunami, known by Greeks as the Deucalion Flood. This took place when the Amu (or Amalekites or Hyksos, the horsemen who invaded Egypt from Turan at the time of Exodus, around 1447 in our chronology, see Spedicato (2010, 2014)), were expelled from Egypt, about 1050 BC. See Velikovsky (1952), whose chronology we prefer, being essentially the one also of Newton (1728, 2009), and notice that Newton considered his work on chronology, ignored by almost everyone, as his masterwork, superior to the Principia. The Phaethon explosion allowed Moses to escape from the pharaoh who wanted to recover gold stolen in Baal Sefon, now Ras Muhammad, located at the southern end of Sinai. Moreover and more dramatically the Deucalion Flood fully devastated and killed almost all the people in the delta, geologic evidence that a tsunami covered all delta having been obtained recently. A similar tsunami ended at the same time the great civilization of the Ohio valley. It entered the Mississippi basin for some 2000 km, as claimed by geomorphologist Stuart Harris. The cause of this tsunami was the huge amounts of methane originating from the unstable methane hydrates that are present in the Caribbean sediments. See again Spedicato (2010) who develops a forgotten statement in Paulus Orosius Wars against pagans, about Deucalion Flood and Exodus being events occurring close in time. If Cheops and post Hyksos pharaohs just repaired the pyramids, let us see which type of repair was more likely needed and then let us propose the date for the pyramids construction. The most likely part of the pyramids to be damaged by a very strong earthquake, that we find associated to the Phaethon explosion and to the events of the Biblical Flood, is their external cover. The inside part does not seem to have been heavily damaged, probably due to the quality of the used stones (perhaps artificial stones, as Davidovits (1984) has claimed, or just big blocks not worked and connected by cement, see Fiorini (2012)), to their stable connection and to the general design. We cannot deal more on this topics, since work is available in the literature by people more expert than we are, e.g. Fiorini (2012). We notice that the two great pyramids had a cover of whitish Tura stone, rich of inscriptions according to Herodotus. Such a cover has now almost completely disappeared, many of the cover blocks having been used for the reconstruction of Cairo, destroyed by an earthquake in middle ages. The third pyramid, as I knew by chance on a visit to Giza where I was accompanied by a former PhD student of Zari Hawass, the head of the Egyptian archaeological department, was supposed to be covered by a gold foil, a plan apparently never fully implemented. Or, if this happened, it was for a short time, the gold was taken away, leaving to the pyramid the name of colored pyramid, that sometimes appears. It is known that boats approaching the delta in the 19th century could see the pyramids at a distance of 80 km from the shore, a fact now not possible due to pollution. But Temple (2000) estimated that when the two largest pyramids were fully covered with the original clean white marble, they could be seen from 300 km; moreover when the sun was high in the sky they would be so bright to make impossible to look at them with naked eye. From the above arises a possible meaning for the original name for Egypt (Egypt is the Greek name): MIZRAIM in Hebrew, MESR in Arabic. Consider MIZRAIM, MESR being just a variation. Initially I thought this to be a word in plural form, but friend Vittorio Sabbadini, a specialist in Hebrew and in old Egyptian, told me that it was a dual form, which fitted the fact then not known to me that only two pyramids had a white cover. Now RA can be associated to the sun. MIZ, MZ can be associated, as a reasonable conjecture, to WHITE, noting the following words that in the root MZ relate to WHITE. MZUNG = white man, in Swahili (a hybrid language with many words from Arabic), MZÉE = old man, i.e. man with white hair and WAZONG = white man, , in Kingwana of Congo, AL MASI = diamond in Arabic and by derivation in Russian, and diamond is a white shining stone. Possibly also the name Moses might have the root in MZ = white. Moses grew up as an Egyptian priest, and Egyptian priests (as many others priests, e.g. Hindu, Essenes, Druids, Incas…) wear a white dress. Our proposal for the meaning of Moses joins the many available in the literature. If the above is correct, then MIZRAIM, modified in today’s MESR, would mean THE TWO WHITE SUNS, a meaning acceptable as referring to the two white pyramids of Cheops and Chefren. A very appropriate name for a country where the most notable feature were these two most impressive buildings, shining under the sun. Here we recall that Felice Vinci, author of a theory setting the Homeric war in the Baltic region, see Vinci (2002), proposed that ITALIA derives from Greek AITHALIA, meaning THE SMOKING ONE, with reference to the many active volcanos. 2. When were the pyramids built? Let us now discuss the difficult question of when the pyramids were built. In the last section we will tentatively address the question of who were the builders. – Several medieval Islamic historians have stated that the pyramids were built 300 years before the Flood, to preserve from the Flood important books and documents, possibly also to provide a refuge for selected people. The king builder of pyramids is named Saurid, son of Salmouk or Samaloc, and sometimes identified with Enoch or with Bardesi, claimed to be a nephew of Noah. Among such scholars we recall Al Makrizi (1364-1442), who wrote a book on history and topography of Egypt; Ibn Abd Alkokm, who dated the event 300 years before the Flood and stated from Coptic books that the construction required six years; Al Masudi (896-956), in his great work translated into French Les prairies d’or et les mines de gemmes, claims Saurid a builder only of the two largest pyramids; Al Murtady (his book was translated from Arabic by P. Vartyier in Paris, 1666) also gave Saurid as the builder. – Radiocarbon dating at the Zürich laboratory directed by professor Willi Wölfli, who worked on the Turin Shroud and is also a specialist of celestial mechanics, was made using organic material, as straw, found between the Cheops pyramid stones. The result of the dating, unfortunately never published, has shown a large variance, with a median value of about 3450 BC. It is remarkable that this date is close to the around 3500 BC given by Diodorus, see for a discussion Vlora and Mongelli (2004). – Analysis of a stellar alignment performed by prof Giancarlo Duranti of Genova University, a specialist of numeric systems originated from Egypt, has given a completion date of 3440 BC, see Duranti (2000). If the date of about 3440 BC is correct, then we are in the predynastic period, which according to Herodotus and Manetho extends back several thousand years. For a recent analysis of such a period see Anna Bacchi, whose large monograph is due to appear beginning of 2016. Pyramid is a Greek word, quite removed from the original Egyptian word that was MER (appearing in Plutarch De Iside et Osiride as TO-MERY). From my reading of several books on Egypt and my questioning of Egyptologists, as prof Giulio Magli of Milan Polytechnic, dr. Vittorio Sabbadini and Marco Chioffi at Milan Philological Institute, dr Massimo Barbetta, scholar Michele Manher…, it appeared that the word MER had unknown origin, not belonging to the old Egyptian lexicon. Here we propose that MER originates from the Indian world, that in the past included parts of the presently Tibetan area north of Himalaya. More precisely that it is related to the Sanskrit word MERU, which has a number of concrete or exoteric meanings, among them the standard one of covered with snow, white, as I was told by prof Brunilde Neroni, a Sanskrit specialist. From a Google inspection another meaning is high, another one in relation to the name variation Sumeru, is excellent Meru, SU meaning good in Sanskrit. According to Roerich (1983) mount Meru is considered by Hindus as the center of the world and domain of the Gods. It is a main topic in the Linga Purana. It is defined generally in the Puranas as at the center of the principal and central of the seven continents, i.e. Jambu Dvipa. Meru in texts usually has a definitive terrestrial geographic connotation. It is related to a certain single very sacred mountain, known in classical times also outside the Indian area. It is the mountain called Meros in Solinus De mirabolibus, where Solinus claims that Dionysus was raised in a cavern of that mountain, possibly the one cited below. It is quoted by Pomponius Mela as sacred to Jupiter, Shiva clearly being assimilated to Jupiter as the greatest of gods. The Jesuit father Desideri, the first western scholar to visit Tibet, in the 18th century, also quotes a cavern in Kailash. He claims that there lived for a certain time Urghien, the founder of Buddhism in Tibet. He gives for Meru the alternative name Rirabcenbo, meaning the center of the world. See, in English translation, Desideri (1995). Traditions also refer to Milarepa, the great religious leader of Tibet, as having meditated in a cavern of Kailash, and to Krishna as having visited Meru. We will give arguments for the Giza system to be a rather faithful replica of the system consisting of three sacred mountains, the main one being mount Meru, located north of India. Notice that we may see the Egyptian name MER as a trivial variation, by language evolution or by design, of the word MERU. The name MERU with possibly some minor changes moreover appears in other places in Africa. This continent was certainly visited, and possibly in some places colonized, by Indian navigators (mainly the Tiranians from SW India). So we have a Lake Meris, south of Alexandria, seat of a community of therapeutics, again from Solinus; a lake Moeris in the Fayoum depression, where two remarkable pyramids exist and the depression received water from Nile thanks to a canal built at the time of Amenhemet III, probably under the direction of Joseph the son of Jacob (the canal is still named Yussuf canal); the mount Meru in Tanzania, that with a 4565 m elevation is one of the ten highest mountains of Africa; and even in Cameroon we may recognize Meru in Meroon, giving the meaning of people of Meru, instead of the usual trivial meaning of place of big prawns…. The main mount Meru can be identified, as currently observed in texts both of Hindu or Jain or Buddhist or Bon religion, with the Tibetan mount Kailash. The two other sacred mountains, whose geographical location we have never seen discussed, within our limited knowledge of the immense Tibetan or Hindu literature, we identify with two sacred but little known great mountains that are located at the entrance of the Hunza valley, in Pakistan. Mount Kailash, reaches about 6400 m, jutting to the sky, from a high plateau of about 4000 m, for about 2400 m. It is located at about 31 degrees of latitude, corresponding to about 100 km north of Cairo, in the southern part of Tibet. From this mountain three great rivers originate: Brahmaputra, flowing to the east, and two of the five great rivers that in Penjab join to form Indus, say the Sutlej and the Indus itself. On the southern side of Kailash there are two sacred lakes, Rakshasa and Manasarovar, separated by a narrow tongue of land. A short increase of the level of the lakes would join them forming a single lake. The shape of Kailash is quite unusual among the mountains that border India on the north, having usually steep and rugged walls. 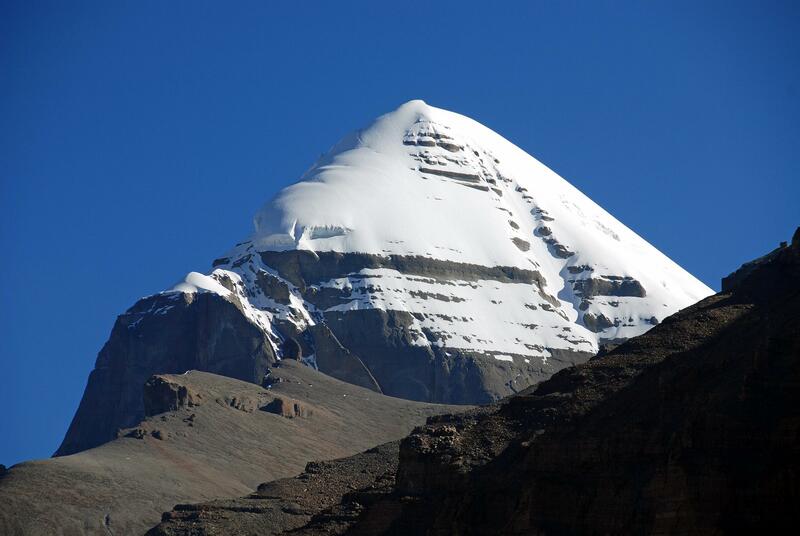 The summit is rather rounded and from certain points of observation it looks like the roof of an Indian pagoda; perhaps Kailash suggested the form of the Indian temples roof…. It is certainly a mountain easy to climb, but its summit is still unclimbed. 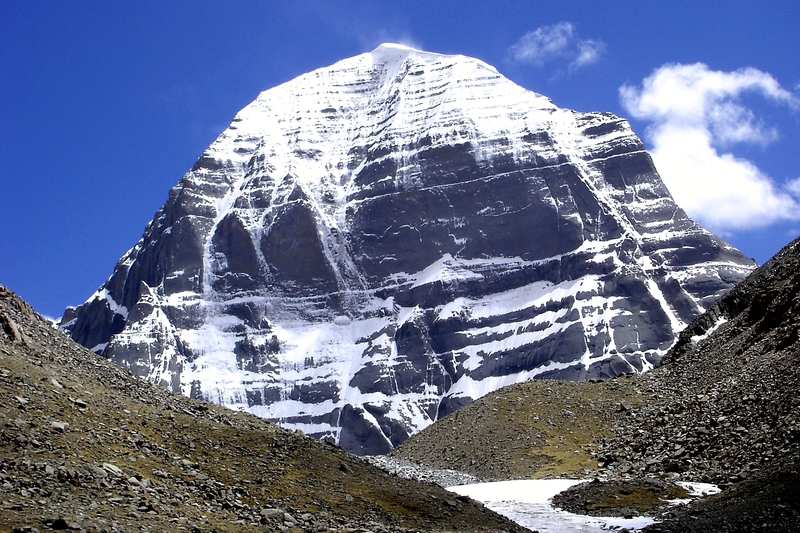 Tibetans and Hindu consider Kailash so sacred that no one should be allowed to climb it. Chinese authorities offered such possibility to the great climber Rheinhold Messner, who refused. Around the mountain there is a trail that allows to completely circle it in few days, its length being about 50 km. Many pilgrims, of the three religions Bon, Hinduism and Buddhism, travel to Kailash for the walk around, in view of the spiritual benefits that are believed to result. It is even believed that dying while on the pilgrimage insures immediate entrance into the Nirvana, avoiding further reincarnations. Now death on the trail is quite common, since many pilgrims are not young, have no training, are not accustomed to the elevation and so pulmonary edema may appear leading to rapid death. For a description of such a pilgrimage in recent times, see Nathwani (2005). It should be noted here that mount Meru appears in sacred Hindu texts as having an elevation of 84.000 yoyanas, a unit that transformed into km would result in 1082 km (albeit there is no certainty on the transformation value). A mountain of such height of course cannot exist on Earth (the maximum possible height is about 12 km) but we may consider that this number, as usual in Asia, see Spedicato (2011), was obtained ritually by multiplication by 180. So dividing by 180 we get what should be the real value for the height of mount Meru. We get, in meters, 6011! A value quite close to the modern 6400 m. The difference may be explained either by a mistake by who did the ancient estimate, or by incorrect value of the yoyana, or by the fact that the Tibetan plateau may have gone up a few hundred meters in the last 5000 or more years under the African tectonic push, possibly stronger during the catastrophic events that affected mankind in the recent past. It is believed that god Shiva has a throne on the top of Kailash, where he sits often in company of his wives, especially of the goddess Parvati, but also of Shakti, one of the greatest goddesses in the Hindu pantheon. In Spedicato (2010) we claimed that Baal Seefon, one of the places of Sinai where Moses passed during Exodus, referred to a sanctuary devoted to Lord Shiva, located at the southern tip of Sinai, over the promontory now called Ras Muhammad…. It was a sanctuary under Egyptian jurisdiction, but in care probably of the navigators from India, related to the family of the Tiranians. Traditional explanations of the meaning of Baal Sefon included that of Lord of the North, which is fully explained by the fact of Shiva sitting on top of Kailash, a mountain north of India. The pictures below show Kailash and are taken from Wikipedia. 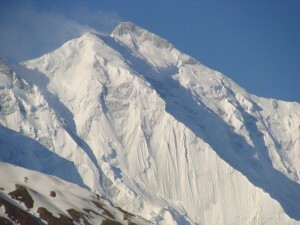 The first one, shot from the north, shows the rounded form of the summit, the second one shot from the south presents a more pyramid-like shape. 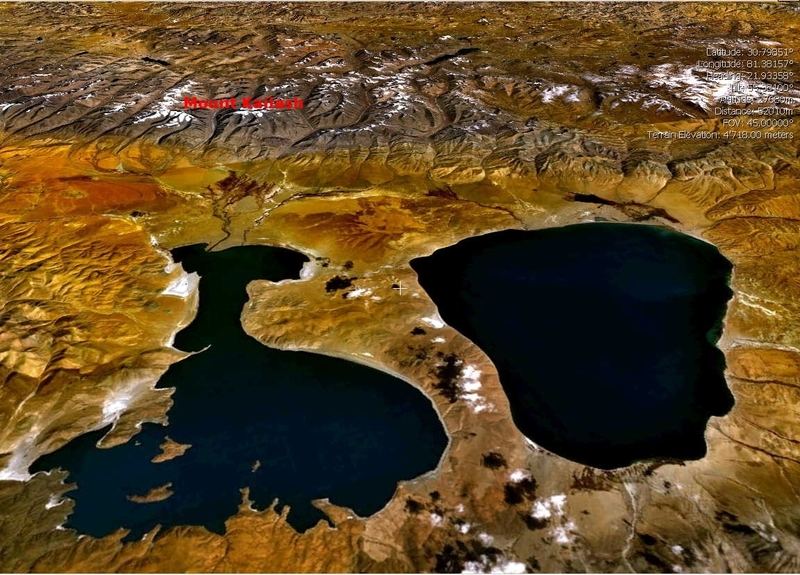 The picture below from satellite shows the two sacred lakes with Kailash on their north. Gold abounds in the region of Kailash. In Spedicato (2012) it is argued that the great mine of Ophir, wherefrom Solomon imported many tons of gold, and obliquely referred to by several classic authors as Herodotus, Arrian and Mela as the place of India where gold was excavated by ants as large as dogs, is the mine located at about 5000 m elevation on a side of Kailash, that was exploited till recently, see Allen (1982). The mine was worked by a special tribe, who lived under the soil level for protection against cold and wind. Nuggets of 50 kilos or more were still found at the end of the 19th century. The ants large as dogs were most probably marmots, present at that elevation, who in excavating the hard sandy soil for their burrows, would bring out occasionally gold nuggets. When the great Swedish explorer Sven Hedin visited the sacred lakes around 1907, he noticed people who were collecting sand from their beaches searching for gold particles. Recently the Chinese found a big gold mine between the two lakes, see Nathwani (2005). The association of Kailash with gold, possibly with the greatest gold mine of antiquity, is important to explain a feature of the Giza system. We now come to the other two sacred mountains associated with Meru. 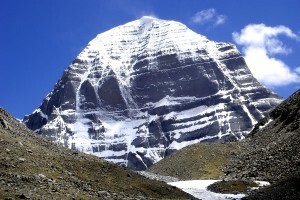 There are actually in addition to Kailash three very important sacred mountains north of India. One is Anye Machin (spelt also otherwise), located in north-east Tibet, surrounded on three sides for some 700 km by the Yellow River, and elevation about 6200 m (before World War II some geographers suggested that it was the highest mountain in the world). This huge mountain is in a region where, before the arrival of communists, who killed over 90% of the local people, control was in the hands of the Ngolok people, followers of the ancient Bon religion, and known as robbers. Anye Machin has been proposed in Spedicato (2001) as the mountain reached by Gilgamesh in his second trip. There he met Utnapishtim, the survivor of the (Biblical) flood. We think this mountain is unrelated to our three sacred mountains, being too far away, and so we consider the two other important sacred mountains that, at our knowledge, appear to be the right candidates. 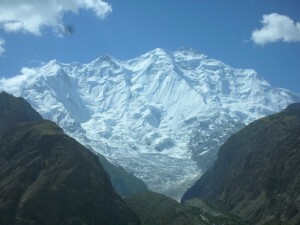 These mountains are the Rakaposhi and the Hunzakunji, located at the entrance of the Hunza valley in Pakistan. In Spedicato (2003, 2004) it is argued that the Biblical Eden is a real geographic region, to be identified with the snow covered Pasu Group in Pakistan (from Sanskrit, Pasu might mean the good father). 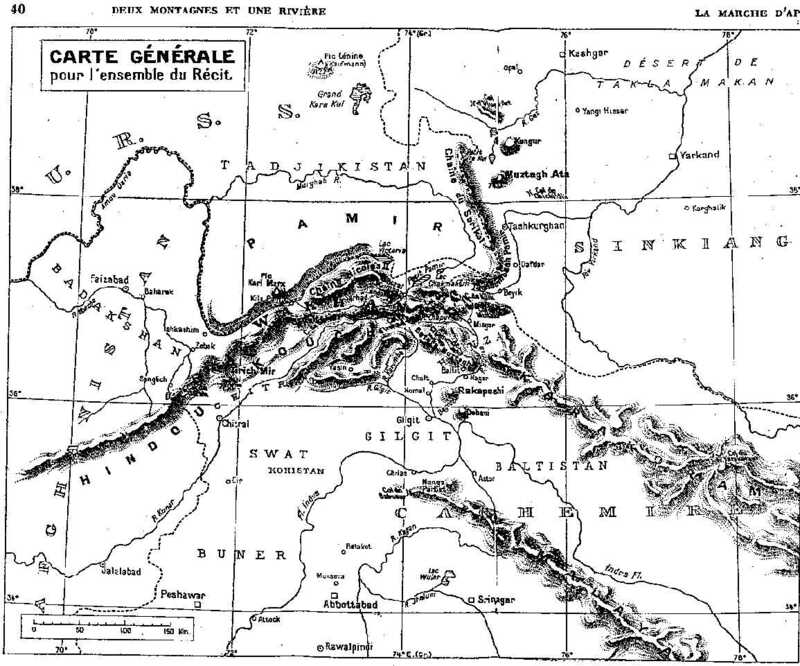 From that massif, four rivers take their sources very closely: Amu Darya or Oxus or Gihon; Mintaka, ending in the Lob Nor desert as Tarim; Mastuj-Konar-Chitral-Kabul, entering Indus in the Pakistani city of Attok, to be identified with biblical Pishon; Hunza-Gilgit, entering again Indus and to be identified with biblical river named in only consonants form as PRT. About the last river, we notice that the three consonants PRT can be related to parot=cow, pirot=fruit, path= fertility. 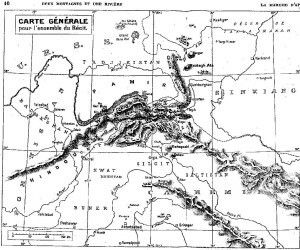 This is the Biblical Euphrates, thus not a river of Mesopotamia, but one of India, see the forgotten work Cosmographia of pseudo Aethicus and other arguments in the quoted papers of Spedicato. Notice also that the ancient name for India is Bharat, or BRT, equivalent to PRT. The Pasu Group identification not only provides four rivers having very close sources (we reject the usual statement in Biblical translations that a single river divided into four rivers, since nahar means river but also snow field), but provides a special place since four huge mountain range converge to it, namely Pamir, Kunlun, Karakorum and Hindukush. Additionally, we have argued that the Hunza valley, located in the east of the Pasu Group, was the Biblical Garden of Eden, or the Sumerian Kharsag. In our opinion Genesis is an essentially correct historical text, once cleaned of some mistakes in the translation from the original text; see Biglino (2011) for a literal translation from the Leningrad code, the most ancient existing Masoretic text (with so called Tiberian vocalization), where he has removed quite a number of arbitrary modifications due to ancient translators. Moreover we believe that Genesis is independent of the Sumerian texts relating to human “creation” . It just deals with the single couple of Adam and Eve, disregarding the six more couples created according to the Sumerian texts. So Genesis misses the events that took place later in the Garden and how people moving out of that special place brought innovations throughout Asia and elsewhere. The Hunza valley, till end of the 19th century a place extremely difficult to reach, has a local population who speaks burushaski, one of the most complex language in the world. These people call themselves Bororo, but are called by other people Hunzakut. The name Hunza has been considered of unknown origin, but we have proposed that it is a variation of the word ENZU, lord of knowledge, a title given to the chief of the Anunnaki, say to ENLIL, lord of the high. The name Bororo may relate to the Bororo hills, not far from lake Balkash. 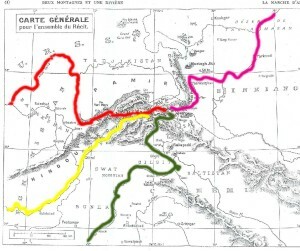 This region, not too far from Alexandria Eschate, the most northern city built by Alexander, was possibly reached by Alexander, who incorporated some of the local people into his army before his attack to India; then they, coming from a region with cool weather, probably hated the heat of India and escaped to the cold remote and possibly empty valley now called Hunza. – while Hunzakunji is not very well visible from Hunza valley, Rakaposhi is a dominating view already for people entering the valley from the Mintaka pass on the north, leading to the part of Sinkiang called Karakol and Kashgaria. Mintaka pass was used before the construction of the Karakorum highway that uses the Khunjerab pass, see again Spedicato (2003) for a discussion of these two passes within the Genesis story. 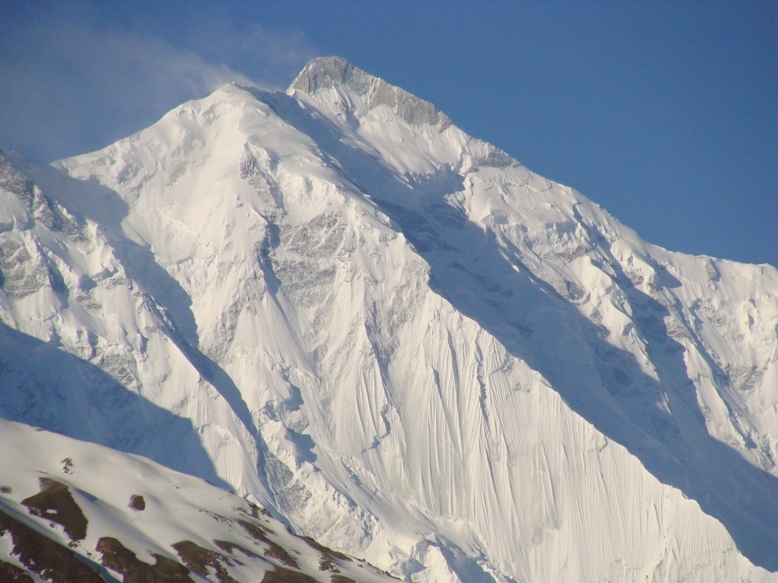 From Mintaka the majestic Rakaposhi appears as a perfect pyramid, white shining and almost perfectly covered by snow and ice. See the description in News from Tartary, published in 1936, by Peter Fleming, who entered Hunza from there in 1935, having started from Peking in company of Ella Mallart. Below on left a picture of Rakaposhi; I remember a very beautiful one in the office of the said Pakistani ambassador in Berlin. On the right Hunzakunji. 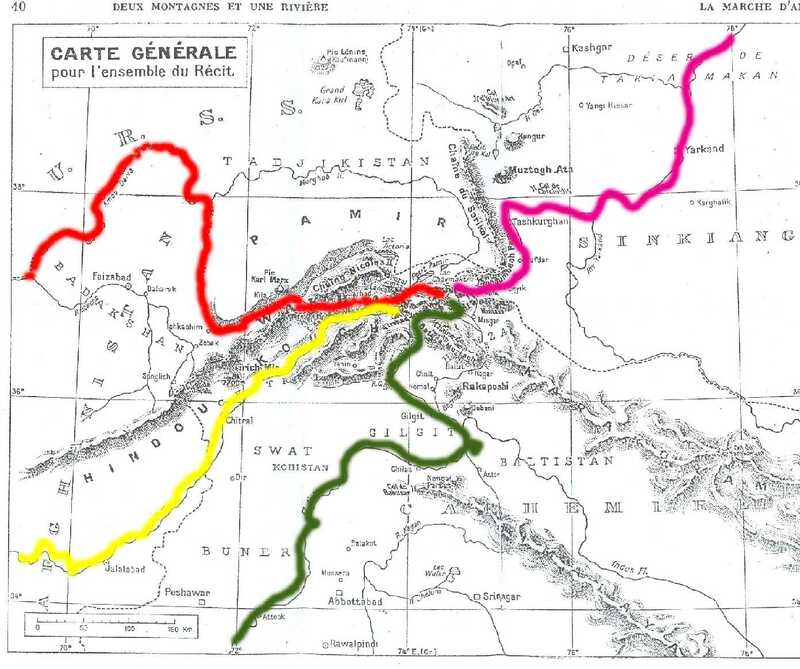 Here we give maps of Hunza area, the second one showing in color the four Biblical rivers exiting from the Pasu Group. 3. Relating the Giza complex to the three sacred mountains north of India. We are now in position to consider relations between the Giza complex and the three considered sacred mountains, suggesting a possible origin of the Giza complex from such mountains. The scenario that we present is of course not final, other interpretations are possible. Then in the next section we deepen our analysis by a proposal on the original choice of the three sacred mountains. First we note again that the name MER for pyramid, not considered to be an Egyptian word and being of unknown origin, as far as I know, can be naturally related to the word MERU; the falling and even the change of vowels is a common phenomenon worldwide, which explains why in many ancient written languages only consonants were used. – the ratio of the local elevation of Kailash over the local elevation (jutting elevation) of Rakaposhi is very close to 0.5; the ratio of the Mikerinos pyramid height, 65.5 m originally, to the Cheops pyramid’s height, originally 146.5 m, is 0.45. The two ratios are remarkably similar, differing by a 10%, especially taking into account that the ancient measurements of the jutting might have been done differently than now, or be less accurate. Also we cannot discount the possibility that since the Tibetan tableau and the Karakorum-Himalaya system are subject to strong tectonic pressure, the original values of the heights of the three considered sacred mountains might have been somewhat different than now. – The Mikerinos pyramid was planned to be covered, as said before, by a gold foil, a proposal apparently never realized. The choice of gold instead of white marble may be related to the presence in Kailash of the Ophir gold mine, possibly the most important in the old world. If the above is correct, then the Mikerinos pyramid, of less height, should be considered as the most important pyramid. There is another interesting feature to be discussed, briefly considered before, namely the statement in several Bon, Buddhist and Hindu texts of the existence of a special cavern inside mount Kailash. It is claimed that Marpa, the teacher of Milarepa who lived in the 11th century in Tibet, knew how to transfer his own soul into the fresh corpse of another man or animal; a knowledge that might go back to Utnapishtim, whose gift of immortality may have meant not immunity to dying, but ability to transfer his own soul to another body without the death passage. It is said that after a disaster affected his son with this technique, Marpa decided to stop teaching it and hid related documents in a cavern of mount Meru. The existence of a cavern, with a narrow entrance about 300 m high, accessible with difficulty from the trail that circles the Kailash, is confirmed in a book of the Hindu pilgrim Bhagwam Shri Hamsa. He entered the cavern in 1907, finding an old man of about 60, sitting naked over a tiger skin. The hermit claimed to know all languages of the world and to live only on water, see Bhagwam (1986). If our relation between the Giza complex and the Meru complex is correct, then the cavern existing on Mount Meru may correspond to another cavern or cavity inside or close to the Mikerinos pyramid. Till now almost all search for hidden chambers or cavities has been concentrated on the Cheops pyramid, without outstanding results, apart from the finding of two dismantled boats in subterranean cavities. So a byproduct of the present scenario would be a stimulation for a similar search in or near the Mikerinos pyramid. 4. A relation with Mother Goddess? – Mount Kailash, with a lower elevation and a rounded top, may be associated with Mons Veneris. This structure in modern women appears as a very modest prominence in the pubic region, sometimes not even visible, but in the past it was probably a rather important prominence. The reason is that Mons Veneris is endowed by a deposit of a special type of fat, a reservoir of calories for times when food would be scarce, more important in women than in man due to their role of milk feeding babies. It is known that people of hunting tribes can eat an enormous amount of game meat, when they cannot preserve it by smoking or salting; in such a case the ingested meat is fast transformed into fat that accumulates usually in the upper thighs, making that part of the body look very large. This phenomenon is called steatopygia. It is well noted for instance among the women Hottentots of southern Africa (they show another unusual feature, namely vulvar lips of extraordinary size, about ten cm, the famous apron of the Hottentots). – Finally the cavity that is claimed to exist within mount Kailash may correspond with the birth canal, lying just below Mons Veneris. The above is just a proposal for which further study should be done. 5. Who built the Giza complex? – northern India, including the Indus-Sarasvati region and the upper Ganges region, especially present Rajasthan… These are the regions where the people described in the epics of Ramayana and Mahabharata lived, say Rama, Sita, Krishna, Arjuna… Notice that while in the epics central and southern India appear as mainly forested wild areas, a civilization thrived in Sri Lanka. There the demon king Ravana was in power, fighting against Rama after abducting his wife Sita. The epics contain certainly elements of historical value, showing existence of great cities and a remarkable technological advance, about which several speculations have been made. According to Kak et al (2001) Ramayana deals with events to be dated at about 3600 BC, Mahabharata with events at about 3200 BC. Notice a reference in Mahabharata to mount Kailash, since the singe god Hanuman goes there to find a medicinal plant that saves the life of Rama. The Mahabharata war destroys the two greatest families in northern India, being an example of the Biblical violence that affected mankind before the Flood. Krishna’s capital city Dwaraka, built apparently on present Pakistani Indian Ocean shores, is abandoned in view of the predicted Flood, and Krishna dies some thirty years before the Flood. There is moreover evidence, see Hancock (2005), of submerged cities near the coast of India, whose ruins are under about ten meters of water. These cities may point to port cities, active possibly for transoceanic voyages, before the Biblical Flood, where water coming from the fountains of the high might have increased the level of the oceans a few meters. The meaning of the fountains of the high will be discussed in another paper. Just notice that a level increase of a few meters would be small compared to the estimated increase of one hundred meters when the continental ice cover disappeared with the rapid end of the Ice Age, see Spedicato (2010, 2014). – the area north of India, where two regions should be considered. One is the region near Kailash, due to the sacredness of this mountain; add the fact that this part of Tibet was important for collecting medicinal plants, leading to a medical science, which is also the basis of the Chinese medicine. Let us recall here that one of the few Tibetan monasteries left untouched by the Red Guards was the one near Lhasa devoted to Tibetan medicine. This area however is not particularly suited to construction of large cities and buildings. From the point of view of great pre-Flood cities we should consider the huge area north of the Tibetan plateau, bounded on the south by the Kunlun mountains, on West by Tienshan, on East by Nanshan and Peishan, on North by Altai and other minor ranges. This area is presently a great desert, with oasis, i.e. the Takla Makan desert, extremely poor of water, and the Lob Nor desert, where the Tarim river, originating as Mintaka from the Pasu Group, ends, often changing its course, in shallow lakes that are drying up, see for instance Hedin (1943). Now it is one of the most impressive results of the analysis of satellite pictures that such a huge desert, about two million square km, was until a few thousand years ago a huge sea of sweet water. The discovery is due to Turkish geomorphologist Eröl Orguz, quoted in Ryan and Pitman (1998), who discuss a flooding of the Black Sea waters as a possible motivation, that we consider too weak, of the Biblical “universal” Flood. The sweet water sea found by Orguz most probably formed with the rapid melting of the ices covering the Tibetan plateau and the quoted mountain ranges where water had no outlet to seas surrounding Asia. We may roughly estimate the depth of such an inner sea at about one thousand meters. After the Flood the level of water in this area decreased slowly, since evaporation was not compensated by the very little rain in that area or the very small amount of water coming from the surrounding mountains. We can however deem that in the fourth millennium there was still a sizeable amount of water in the region. Moreover we suggest that this inner sea was called Abzu, a hybrid name where AB is water in Persian and other related languages, ZU, SU is GOOD in Sanskrit. A hybrid name as there exist several in the world and especially in Asia and very appropriate for this inner sea. The word ABZU may also be at the origin of the word ABYSS, since the sea, observed from the surrounding mountains reaching even over 6000 meters, was a water sheet lying on great depths. The origin of the Sumerians has been debated. Sumerian is not their original name, but may just point to their origin, claimed to be from the east, from the land called DILMUN, and so from somewhere close to the mount MERU or SUMERU. An origin therefore possibly from the Tibetan region, once more extended than now. Notice moreover that the Sumerians called themselves black heads, which is exactly the name, bopas in Tibetan, that the Tibetans use for themselves, or used, as Alexandra David Néel, who spent years traveling in Tibet, says. About Dilmun, the hypothesis often accepted that it should be the small island of Bahrein, has to be rejected on many grounds, including the trivial fact that this small island, used to great extent as a huge cemetery, is not on the east but on the south of the Sumerians territory in Mesopotamia. We propose that DILMUN is a word to be explained using the zhang zhung language, a lingua franca till about 800 AD in Asia north of Himalaya, being related to a kingdom of south western Tibet central to the Bon religion, to which mount Meru belonged. A dictionary zhang zhung – Tibetan was found in the famous cache of Dung Huang, see Hummel (2000). Despite the dictionary has less than one thousand words, we see that DI means BLUE, MU means SKY, so that DILMUN might mean THE PLACE OF THE BLUE SKY. Such a definition applies very well to the Tibetan region and to the deserts north of Tibet, where the sky is almost always extremely clear and due to the elevation is deep blue, which so much fascinated Alexandra David Néel. From the above we may conjecture that Sumerians came from the Tibetan region or possibly from the region around the great inner sea of sweet water. They arrived to Mesopotamia after the Flood, for reasons presently unknown to me. In the period before the Flood they most probably had an advanced civilization, and knew well how to build cities and great palaces. Here we recall that Sumerian traditions state the existence of ten, or seven, see Gleick (2006), prediluvian kings and the existence of several cities. Following Spedicato (2012) the time span of the prediluvian Sumerian kings turns out to correspond quite closely to the one of the prediluvian patriarchs; notice that we do not believe that they were the same persons. Notice also that Bible gives to patriarchs long ages, but not so enormously long as the Sumerians do (the actual ages are obtained by dividing by 180). One of the prediluvian cities was Eridu, built on an island in the Apsu, dominated by the great Esagila Palace. The events of the Flood certainly destroyed Eridu and the other cities, motivating at a certain moment the Sumerians to move to Mesopotamia, where they built cities with the old name of those in their original land. Of course, we should also recall the assumption of several writers that pyramids were built not by humans, but by aliens of a superior intelligence. A hypothesis also worth of consideration, but beyond the limits of this paper. We are indebted for important information to dr Guido Vogliotti, dr Vittorio Sabbadini and the guide who told me that the Mikerinos pyramid was supposed to be covered by a gold foil. Giza, Hunza, India, Kailash, MESR, MIZRAIM, Mons Meru, Pakistan, Rakaposhi. Bookmark.